CERT is an excellent class developed and supported by FEMA and State OES. The class is helpful in preparing the student for an emergency or disaster. The ideal student outcome is to be prepared to first, take care of yourself and your property in an emergency or disaster situation. Secondly, once your needs are cared for, the student may be able to assist their neighbors and neighborhood if they choose to do so, through an established CERT team. Santa Cruz County has a CERT auxiliary which the student may choose to become involved in. The CERT Auxiliary is a 501(c)(3) organization that provides support to CERT teams with personnel database, re-certification and disaster service worker badging to name a few things. The CERT Auxiliary also provides training and instructors to the various teams so all CERT members are kept up to date on their training. Locally there are groups like Felton Area CERT, Boulder Creek CERT that are looking for interested persons with this type of training to assist their efforts. 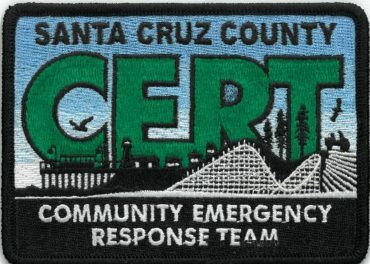 If you are interested in attending a CERT class, joining a CERT team, or just want more information about CERT, please check out santacruzcountycert.org to find the next available class and to sign up.